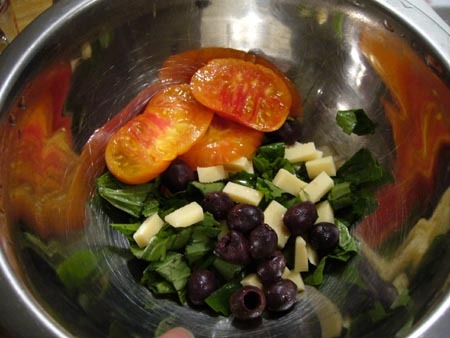 You need fresh basil, olives, cheese, balsamic vinegar and olive oil to make the salad. And of course! Heirloom tomatoes. So delicious. I pity anyone that is eating the beefsteak tomatoes from the big grocery stores that are white inside and taste like paper. Tsk tsk. 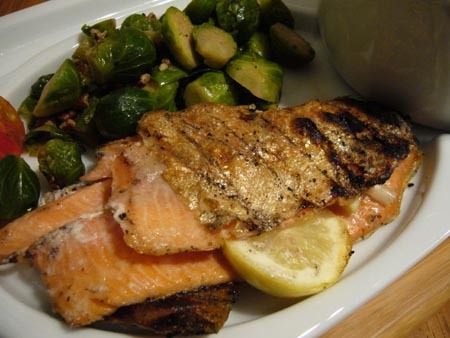 Hey next time you grill salmon put some lemon slices inside. And tuck in some garlic too. You’re wondering about the European Soldier Beans. Well… that is what they are called. I didn’t make it up. Venturing into the world of beans, legumes, pulses and grains is enjoyable (as long as you soak them and prepare them properly… otherwise it can be an “uncomfortable” world). These looked like white and red speckled ceramic beads before they were cooked. Unfortunately you can see that I let them run out of water at the end and their little shells cracked. 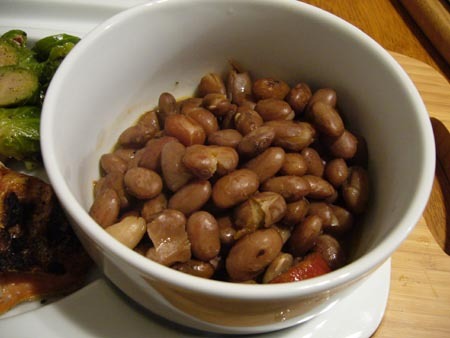 Cook beans until they are soft – NOT mushy. I don’t know if there is such a thing as American Soldier Beans. They would probably invade your pantry. Here’s the Whole Foods guide to these beans, as well as a guide to preparing a variety of beans.